Well, the year is just about over. Only a few more hours till we start a brand new year. Do you have plans to go out and make merry, or will you be staying in and enjoying a nice quiet evening with snacks, good company and maybe a good movie? I was never one for going out and partying on New Year's Eve. There are always too many drunks out on the roads, and I like to wake up on New Years Day healthy and in one piece. So a quiet evening in works really good for me. Most years I work on New Year's Eve, but this year I can stay at home with Pogo. This morning, just as day was breaking, I went outside (at work) and took a photo of the snow to share with you. It was such a pretty, serene picturesque landscape, don't you think? Did I mention that it was a wee bit on the chilly side this morning? Actually it was more like "froze my fingers off trying to take the photo". 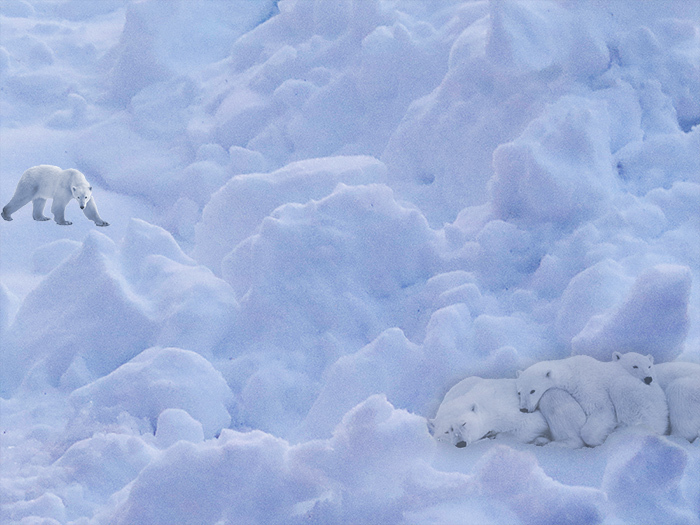 We don't often get polar bears around these parts, so finding this many of them was quite a surprise. Okay, you got me! Actually, when I took this photo of the snow outside, it was a close up and looked like huge snow hills - rather mountainous. So of course I needed to find me a few polar bears (thanks to Google) to make the picture complete. Well anyway, I had a lot of fun doing this. I read a bit more in one of my photography books, so today I have some new things to try on my cameras. One of my resolutions for the new year is to get better at photography, and get more familiar with all the buttons and settings on my cameras. There is so much to learn, and I'm looking forward to it. I should probably make a resolution to lose weight, but it never works so this year I will be more realistic. My resolution will be to maybe exercise more. That right there will be good for me, and might even shed a few pounds. Okay, enough chit chat. 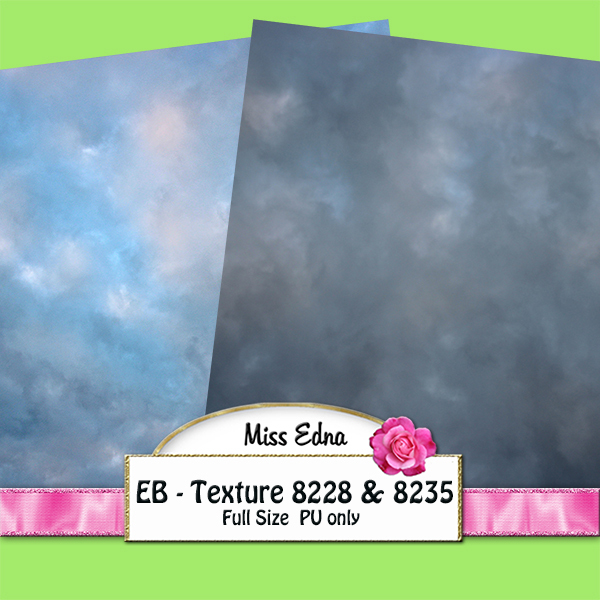 I have a new texture freebie for you. I made it from one of my snowfall photos. I hope you can use it. Here's my preview and the download link. Pogo and I had scrambled eggs with green peppers and bacon for breakfast. Mmmm, what a nice way to start the day! I'll have to give some thought to something special for supper tonight. Hmmm, maybe Chinese take out? I hope all of you has an enjoyable New Year's Eve, and a Happy, Healthy and Prosperous New Year. Till tomorrow, Y'all have a fabulous day. Good morning on this rather snowy morning. Unless we have more snow coming our way, we did not do so badly. The snow started coming down yesterday, and stopped sometime during the night. We ended up with several inches, which Joe has been busy shoveling away. Next we have the Christmas Story Bear. 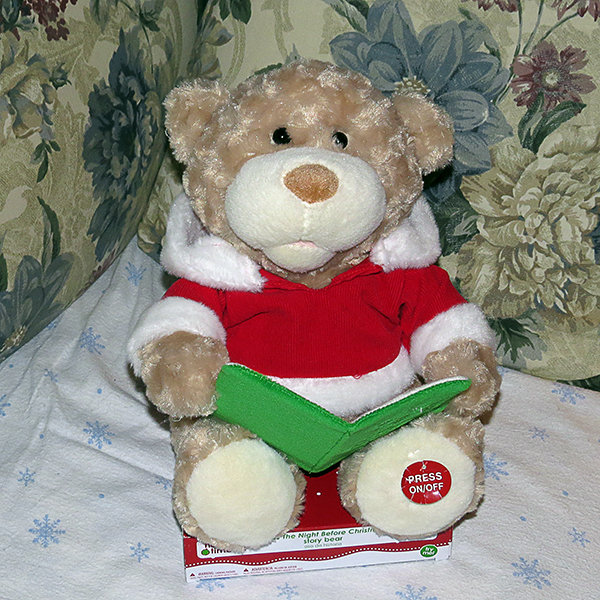 This one is mine, and recites "Twas The Night Before Christmas". We played a lot with this one too and had to replace the batteries. 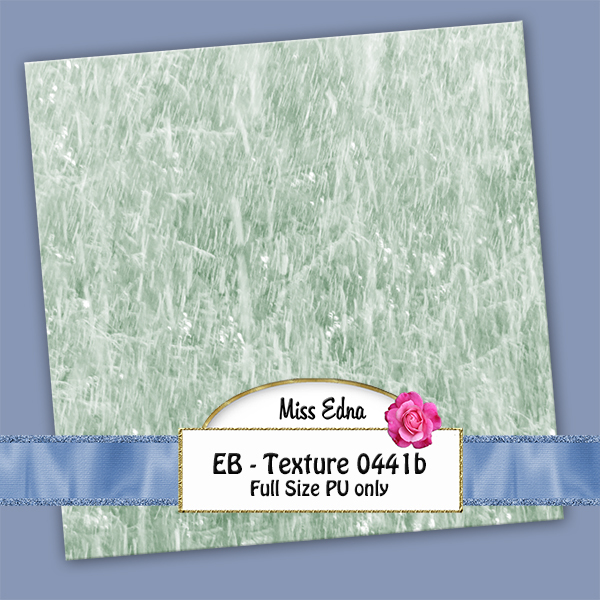 While the snow was falling yesteray, I took some photos to share, but when I looked at them, I decided they would make great textures. So that's what I did with them. I'll get them wrapped up and post them for you tomorrow and Tuesday. I also want to show you the adorable framed photo that my friend Mary Ann made for me. I love the doggy bone mat. Note, the shadows across the picture did not come with it. Those are my fault. My little tree is going to have to come down and be put away during this upcoming week. I need the table to work on my taxes. Janet will come by to help with them, and hopefully everything will be done before the end of January. Well, actually it has to be because my appointment with the accountant is the first week in February. I made an early appointment in order to get the taxes done and over with early. My little mini vacation is all over today, and tonight it's back to work. I did enjoy my days off though. I'll have to do this every once in a while. It helps to get me energized. Not enough to be like the big pink bunny, but just enough to keep me perky. lol. On that note, I'll leave you and make myself another cup of coffee. Till tomorrow, Y'all have a wonderful day. Good morning on this rather gray day here in New England. We had a tiny sprinkling of snow overnight, but the big stuff is due here soon. We're supposed to be getting maybe an inch of snow during the day, and then up to another eight inches overnight (although the weather map shows 6-12 inches) with flurries tomorrow. We'll just have to wait and see what actually comes our way, but we are ready for it. Another Christmas box arrived with new photography books and a beautifully framed photo of Pogo. Thank you so much Mary Ann. I'll be hanging Pogo's picture on the wall next to Tootsie's picture. I've already started reading my new books. I read a bit, grab the camera and check what I've just read about, then back to the book. This is definitely my kind of fun. I also have another special gift to share. My daughter Deanne always give me lottery tickets for Christmas. 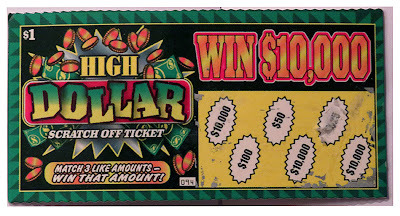 This year tickets included one for a new game "High Dollar". It says "Win $10,000. Match 3 like amounts - win that amount!" My ticket had three $10,000 amounts on it so I started right away scratching - and scratching - and scratching. Finally a bell went off in my head and I stopped scratching because I was just making a mess of the ticket..
On the back of the ticket, under "Official Game Rules" it says..... "Winning tickets of $100 or more must be sent by mail or in person to the Money Fairy, 123 NoWhere Drive, in Make Believe Land. Valid only in your dreams. Any resemblance to a real or implied lottery ticket is what makes it fun. Odds of winning 0 in 10,000." How about that? Anyway, I had fun trying to win the $10,000. Now it's time for me to make some lunch here. 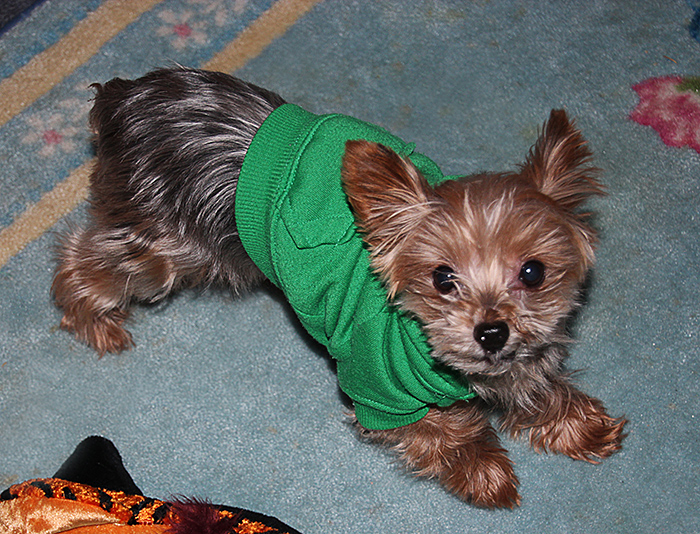 Pogo is getting restless, prancing back and forth between me and the refrigerator. lol. So, till tomorrow, Y'all have a wonderful day. Imagine Paying $8 For A Gallon Of Milk? The sun is shining this morning, and there is a light coating of snow on everything. We had a little snow late yesterday, and the weatherman is forecasting more for tomorrow. It's a toss up though, as to how much we'll get. Depending on which forecast you watch, we should be getting somewhere between 1 and 6 inches. We'll just have to wait and see. I'm watching the chatter about the economic problems that will soon be here. For one, the farm bill. If a new one isn't passed before the new year, milk and dairy products will be priced out of a lot of folks' income range. All one hears is how the Republicans are the bad guys by not giving in to the Democrats. To be perfectly honest, it wouldn't hurt if the president and the democrats gave in a bit too. For the good of all of America, I think it's time to get rid of the party system. They fight so much between themselves that it hurts the whole country. If there were no parties, Congress would have to just focus on the policies of the country, and not what will fatten up their pockets the best. And I say "shame on the president" for not setting a better example of a good American. Does he not understand anything about brotherhood and sharing? Everything takes give and take in order to work well. You can't have everything your way and expect everyone else to get along fine. I for one, will give up milk if it goes to $5, $6, $7 and $8 a gallon. I will miss my favorite cheeses and the dishes that need them. This in turn will hurt the farmers seriously. Oops, there goes another big hit on our economy! That's it. I promise not to start up a new band box over our seriously selfish politics! Nuff said! I have some interesting photos to share with you this morning. 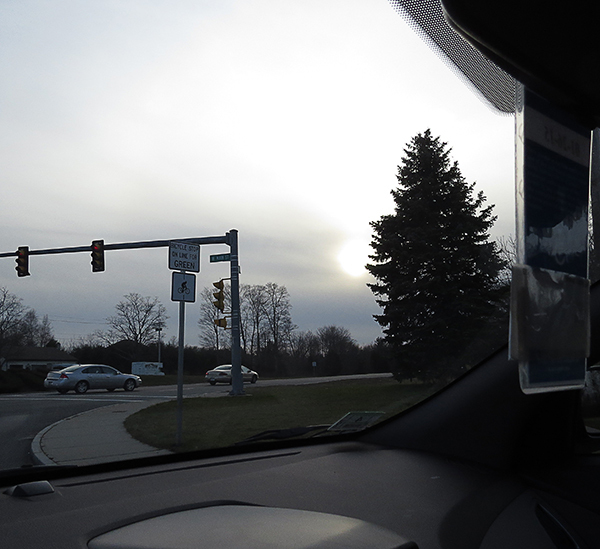 These were taken on Monday (Christmas Eve day) around 3:30 p.m. while I was on my way to Deanne's house. In the first photo, I was slowly approaching a red traffic light when I noticed the sun doing it's best to shine from behind a very thick cloud layer. However, just a little ways over, there was the line that separated the cloud layer from the rest of the blue sky. 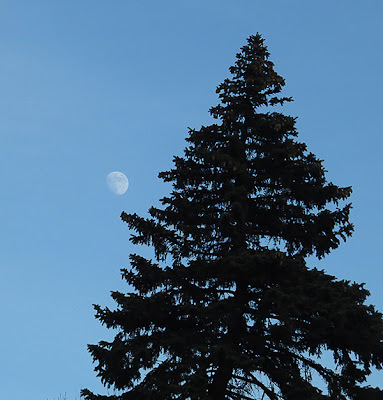 A few minutes later, just before I turned on to Deanne's street, I saw this great big gorgeous moon in the blue part of the same sky. Of course I had to stop for a photo. I don't remember ever seeing both the sun and the moon so close together at the same time. And yes, this is a different tree. We have a lot of these beautiful green giants. My house is almost surrounded by them. Anyway, I just thought this was very interesting and wanted to share it. Yesterday, I did a lot of laundry, (scatter rugs, blankets and some clothes) so today I think I'll take it easy and enjoy some of my new books. I have enough new learning stuff now to keep me busy for a very long time. lol. So, till tomorrow, Y'all have a wonderful day. Good morning. Well the white stuff is all gone. It's been pouring rain since last evening. Today is supposed to windy, rainy and 45 degrees F. It's looking like we might be getting a bunch of snow over the weekend. If it doesn't get here, I won't complain. lol. Janet was here last night and brought me two big boxes of different kinds of bird food for the new bird feeder she gave me. This year, my yard should be birdie heaven. I'm thinking of moving one of the hummingbird feeders to the other side of the house closer to the flower garden. 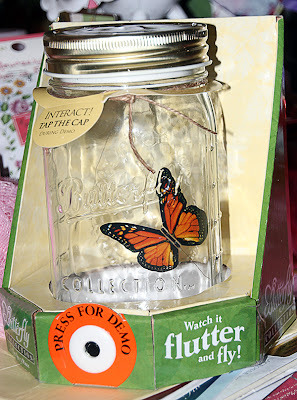 We get a lot of butterflies out there, so maybe this will attract more hummingbirds too. Let me share a couple of photos of some of the goodies we've been munching on. This first photo is the Christmas tree cake that Dee Dee made for all my dwarfs. (and me too!) Needless to say, once I set it out on the kitchen table, it got eaten up in no time at all. This next photo is what was left of Nani's Davinities when Santa got here. Of course, by the time he was ready to leave, there were no cookies left at all. lol. Nani, Santa said they were the best cookies he had all night! Did I mention earlier that Janet also brought a huge pan filled with home made cookies with her last night? Oh my goodness. She brings so many because she knows I like to share them with the dwarfs and Dee Dee and Eddie. 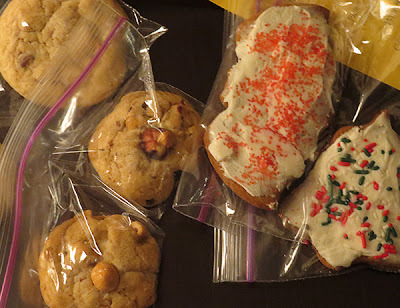 First though, I pick out my favorites, the oatmeal raisin cookies, and then I share all the other cookies. Janet also brought a couple of the cutest musical Christmas toys for Pogo and me. I will take photos of them later today so that I can share them with you. I have to say though, that she had already played so much with my toy that we had to put new batteries in it before I could play with it. LOL! This time next week, I'll be ordering another blog book. 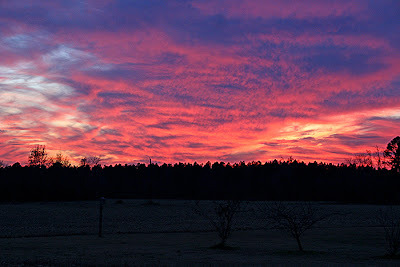 This one will be the last six months of my blog, July through December 2012. If I keep on blogging till I'm really really old, Audrey will need a truck to carry all the books home with her. 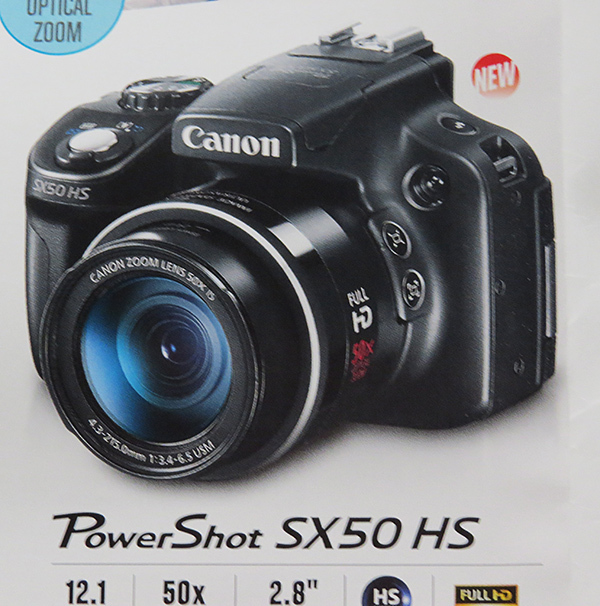 I've ordered a printed book manual for my new camera and a couple of extra batteries. These are must have accessories. Manufacturers just don't seem to understand that when you are out shooting photos, a digital manual does you absolutely no good. Now I'm going to make another cup of coffee and get some laundry started. So, till tomorrow, Y'all have a fabulous day. Good morning. It's 5 a.m. and in a couple of hours I'll be going home to spend some fun time with Pogo. Thank goodness the snow did not build up anything much. Just enough to cover everything with a light blanket of white. Tonight we will be on a high wind watch through Thursday. Then I guess we'll be getting more snow by Sunday. Of course! That's when I come back to work next! The Mrs had a very nice Christmas, and was quite mellow and tired by the time I got here last evening. Once she was all tucked in bed for the night, I was able to have a nice chat with Su via Skype messaging. For whatever reasons, we were all forced to change from Windows Live to Skype for messaging. I suppose at some time this will feel easier. But for now, it is a pain in the neck. It took me 45 minutes to figure out how I might get into Skype in order to chat. They just would not accept my email, name or password. Grrrr. However, I did finally get in, and had a wonderful learning lesson. Su is so smart! Every time we chat, she teaches me something new about Photoshop. She is beginning to feel much better. We talked it over and I think we've decided that she will post her parts to the kit during January, and I will post some new freebies. We are aiming to be back on track with the kits by February. If it changes, we'll let you know. I took a few photos of the gifts under my tree to share. There wasn't enough room under the tree so some stuff spilled over to the floor nearby. See the jar in the front? Well, it has a butterfly in it that flutters about, and is quite fun to watch. 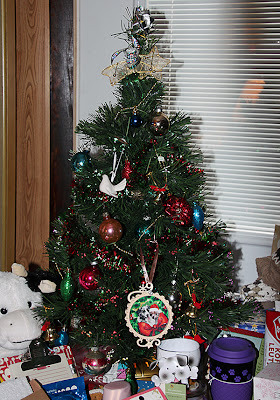 My little tree now has six new ornaments, that have been given to me (and Pogo) since I started blogging. It really is a tree of fond memories. The one thing that I had asked Santa for was a point and shoot camera that I might carry about sometimes instead of my DSLR. As usual, he was v-e-r-r-y good to me! This is what he brought for me to play with. So now, I have lots of learning to do all over again. It is much lighter, and I've taken a few pretty good photos with it so far. 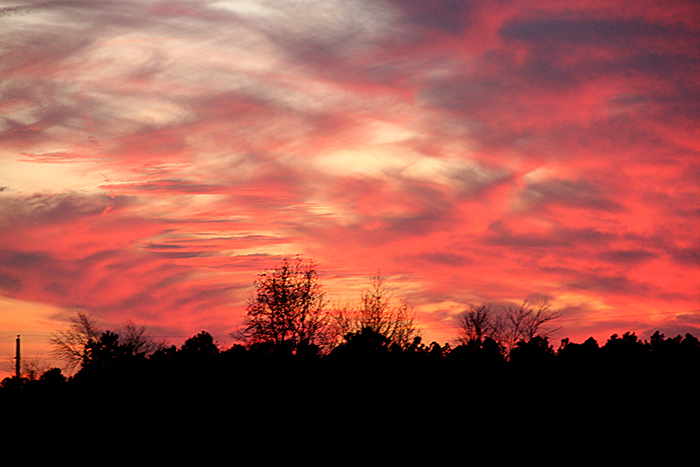 However, there is a lot to learn about how to use the settings, close-ups, etc. I see another very busy year coming up for me! Now I think I'll catch up a bit with my emails and do a bit of blog reading. Till tomorrow, Y'all have a wonderful day. Good morning and a very Merry Christmas to all of you. Guess what? We are having a WHITE CHRISTMAS!! When I looked out at 3.m. there was a light dusting of the white stuff everywhere. It's been coming down steadily, and now everything is covered with snow. It's quite pretty, but I hope it stops soon. I have to drive in it tonight to go to work. Wow, what can I say? 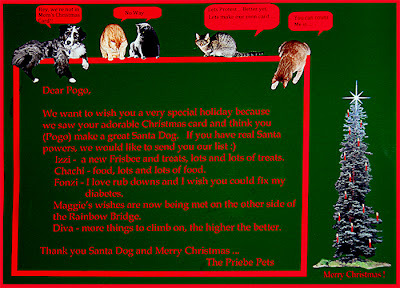 My family and friends, and blog friends and Pogo have made this one very joyous Christmas. During the night, I woke up just as Santa was tip toeing out to his sleigh. But I called him back for a hot cup of tea or cocoa. He said he was just going to let me sleep, but it's not Christmas if I don't get to see Santa. We had a small visit, he still had many many miles to go before his journey was done. And of course, he brought me something wonderful that I had asked for. I'll save that for tomorrow though, because this morning is for Pogo. 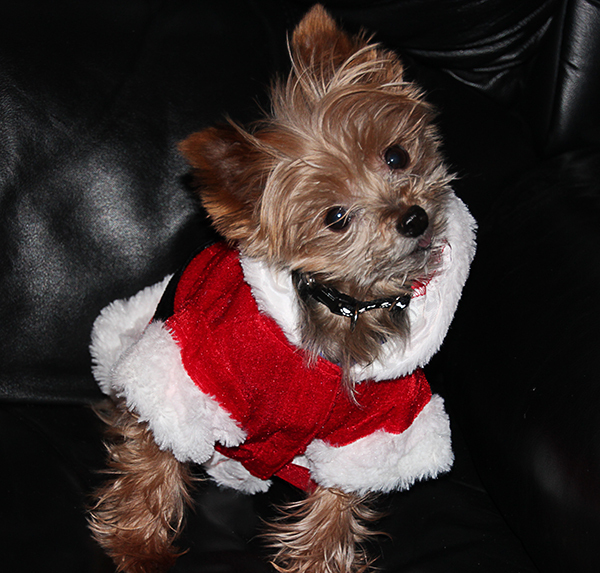 I promised a photo of Pogo in his Santa suit, and here he is in all his handsome glory. My little guy had himself a fabulous time this morning, opening and checking out all his wonderful new goodies. Wow, he certainly hit the jackpot! He got a new jacket, three new sweaters, doggie premium fillets, several doggie toys, an absolutely gorgeous photo ornament featuring him and his friend Izzy, and a soft and fleecy blanket which he immediately rumpled up into a ball and curled up on it. I want to thank everyone for making this such a wonderful day. Kyra, as you can see from the photos, your box arrived yesterday. Can you tell how happy Pogo is? lol. 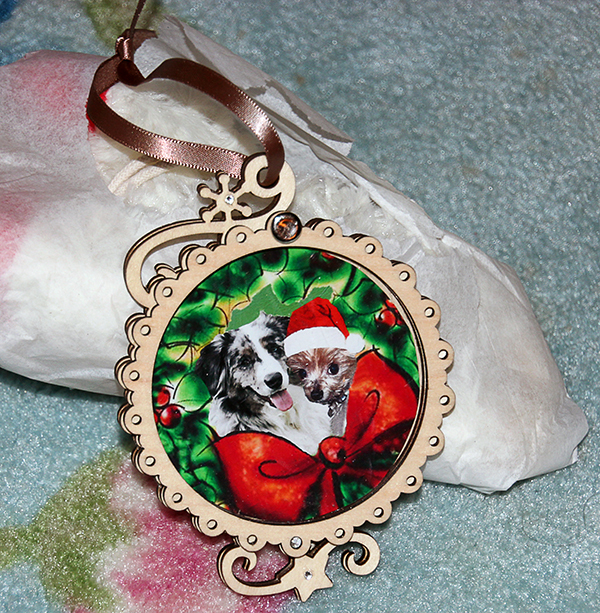 Andrea, we'll be hanging that beautiful ornament on our tree every year alongside our other special ornaments. Thank you so much. Nani, Santa and I finished up the rest of the Davinities. Mmmm, mmm, mmm. We both want to thank you so much. Absolutely delicious! I will take photos of some of my other presents to share with you later. 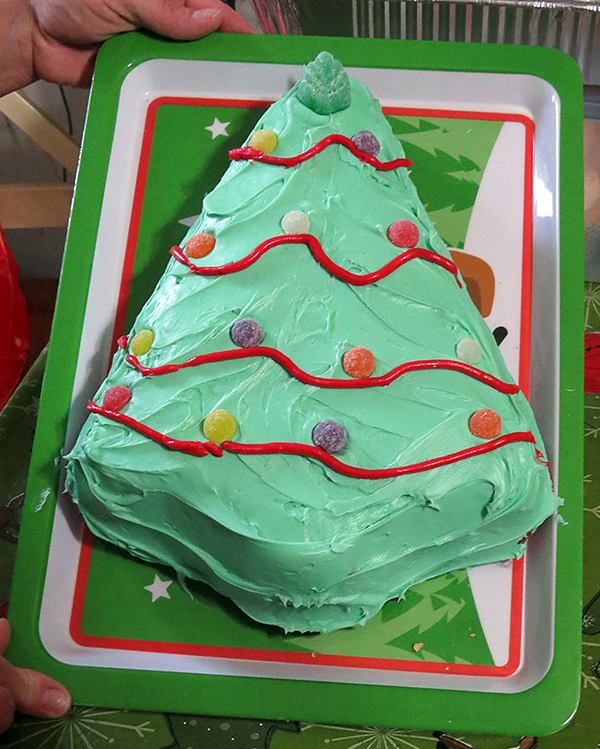 Deanne baked some of the most delicious cranberry bread and a very pretty Christmas cake. The cake is already half gone and as soon as the rest of the dwarfs come home, the cake will be finished. I don't know if I'm going to share the bread yet. lol. 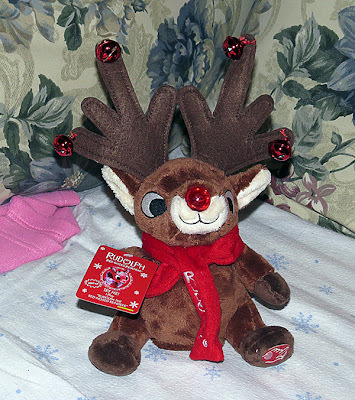 I still have a couple of things to open, but I wanted to get these photos of Pogo posted, and of course your Christmas freebie. I've made for you a couple of textures. Have fun with them. Now I'm going back to Pogo and Christmas. Till tomorrow, Y'all have a wonderful joyous day. It's 5:45 a.m. and I'm at work. The Mrs is still sleeping (thank goodness - it gives me a chance to post my blog) and I've been looking up a few of the new toys on Google. One ad on TV yesterday caught my eye and made me sit up and wonder what is happening in the world today. They were advertising for a fun new game called "Doggie Doo". I guess you take your doggie for a walk, he poops and you scoop it up. I guess you win if scoop up the most doggie poop. Excuse me?? There's also a dolly called "Baby Alive" who, after you feed her, will poop green slime. Well dang me! I just gotta have me one of these little darlings! There's even a book that explains how everyone and everything poops. Every normal child really needs all of these marvelous new toys! Folks, somewhere along the way I have been misguided. 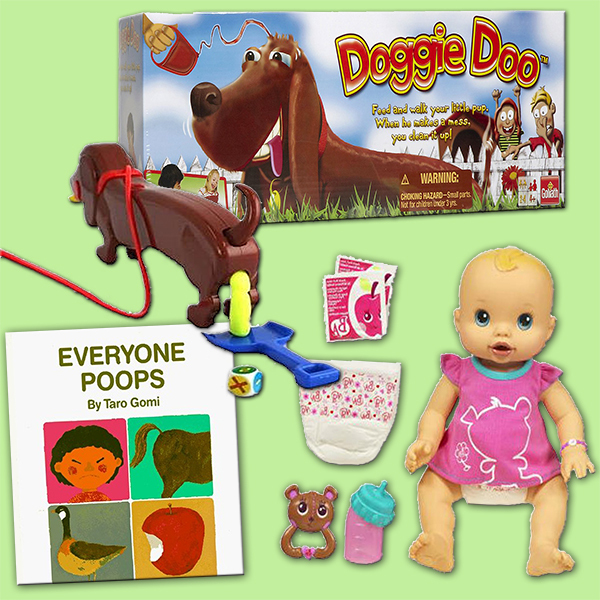 I never realized that it was important and fun to play with doggie poop and dolly diarrhea . No one ever thought to give me a book explaining that everything poops and it's okay to play with the stuff. I never passed all these wonderful things on to my children either. What a disservice I've done to them! PULLEEZE!!!!! Whatever happened to nice dollies and stuffed doggies? The Little Golden books were nice too. Whatever happened to children being just children while they can? Maybe there are some important qualities to these toys but I fail to see them. I guess I am now officially a dotty old lady! Enough ranting! Today is Christmas Eve day. Later today (around 3 p.m.) when I leave here and head home, I will go to Deanne's house where we will have our Christmas Eve gathering and I will pick up my Pogo. After that, Pogo and I will go home and rustle up some supper. Then it will be time to curl up on the sofa and watch a Christmas movie while we wait for Santa Claus. I tell you, I am having a grand time this year for Christmas. Most of that is due to Pogo and his adorable antics. 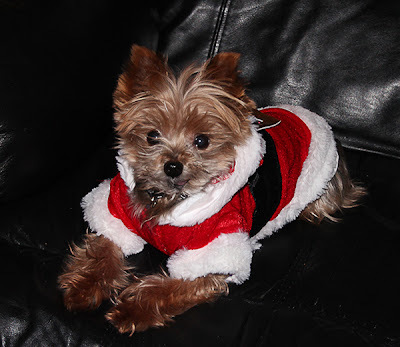 My daughter in law bought him a Santa suit, and I will take photos of him wearing it. 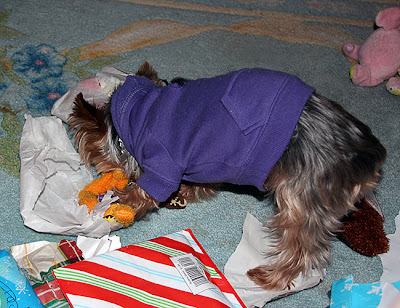 I've asked Santa to wrap most of Pogo's stuff in tissue paper to make it easier for him to tear things open. Yessir, I'm looking forward to Christmas morning. Now for your last two parts of "A Child's Xmas". Your download links are just below the preview. I hope you have fun scrapping with this kit. I suppose many of you have lots of running around and last minute wrapping to finish up today. I hear there will be lots of bad weather in parts across the country. Do be careful and get back home safely. I'm hoping Santa will be very good to each of you and your furry kids too. If you decide to stop in tomorrow for a minute or two, you will find a Christmas freebie . So till tomorrow, Y'all have a very Merry and Blessed Christmas. A Great Tip For Your Holiday Cleaning! Good morning. It's 4:30 a.m. and I'm at work. Mrs is snoring and all is well. It's crunch time folks. If you haven't finished your shopping and wrapping, you still have today and most of tomorrow to do it. Yesterday the mail lady brought me several packages, one of which is the beginning of my shopping for next Christmas. I found this delightful item (can't tell you what) on E-bay, and just knew that the ladies on my gift list would really like it. So, voila! It's now in my gift drawer and noted in a little notebook that I leave in the drawer. A friend sent me something that I thought I should share. 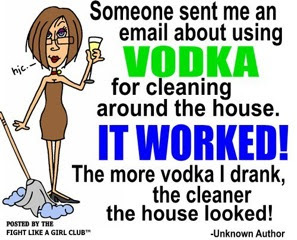 It's a great tip for getting your household chores done in quick time. Lord knows I really need all the help I can get in this department! Hmmm, I wonder if a bottle or two of Sam Adams light will do the trick too. I still have most of the case of beer that I bought last March. I've often wondered why I bought a whole case of it. It takes me a year or more to drink a six pack or less. I'll have to give Sam Adams a try with the housework thingy because spring water doesn't help a bit. A while back, I bought a box with an Amaryllis bulb that was on sale. When we (Joe helps with all the planting) opened the box, we found that the bulb had started growing - sideways. Joe planted it and we put it in the window. 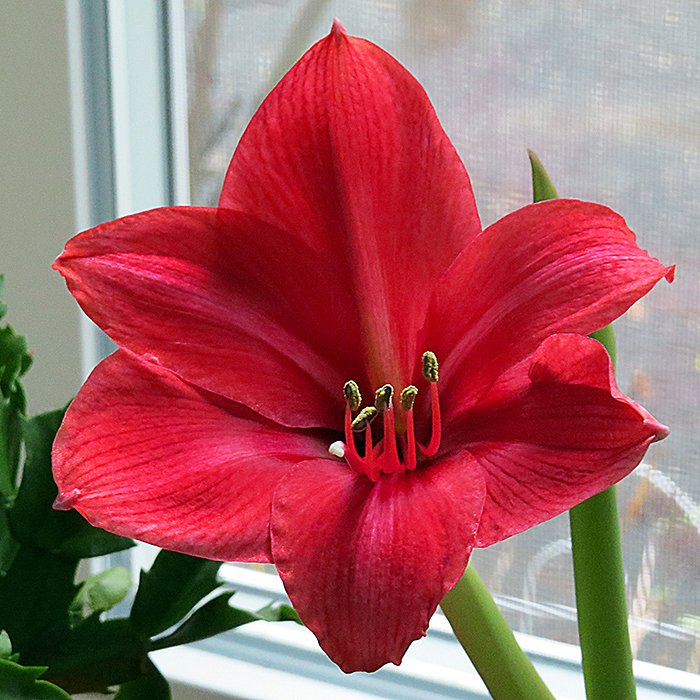 Eventually, the sun straightened the stem and the first bud opened a few days ago. It's a beauty! After Christmas, I'll watch for sales and pick up another plant or two. It makes the house more cheery for the dwarfs. At least two of them are into gardening, so I'm thinking that we might have us a bigger veggie garden next summer. That would be really nice. On my way home this morning, I want to stop at the Walmart nearest my house. I have something to return, and I want to pick up some more spring water. Yesterday at the supermarket, they were asking $5.00 a case for spring water. That's highway robbery! Everyone else has it for between $3 and $4 a case. Yesterday afternoon Deanne and Eddie stopped by with Kevin (my youngest grandson) so that we could load up all the presents and one large fruit basket into their car. You never know what the weather will bring, and I like to know that the presents are all delivered in time for Christmas. Well that's about all the news for this morning. Another hour and three quarters and I will be heading homeward. So till tomorrow, I'm wishing Y'all a fabulous day. Woo Hoo! Only three more days to go!! It's a little after three in the morning and I've just finished the last bite of Nani's loaded loaf. (I think that's what it was.) Oh my, yum yum yum! And the peanut butter krispy squares are gone too. Oh dear, there must be a mouse in the house. But a nice mouse! 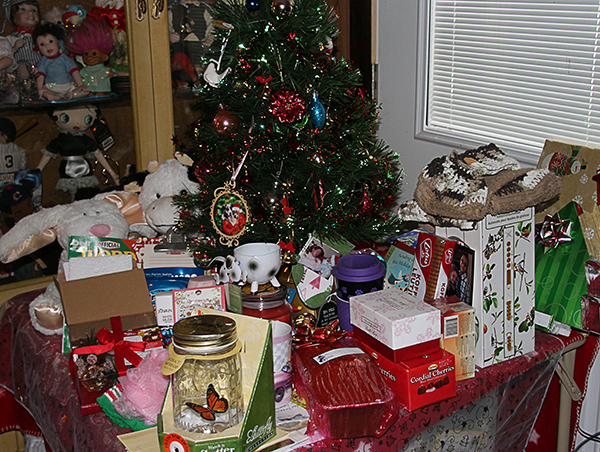 The rest of the goodies are in the box still, and safely tucked away behind the tree. I'm saving them for Christmas. Who knows? Maybe I'll put one of the cookies out with a nice hot cup of tea for Santa on Christmas Eve. By the time Santa gets to my house, he's rather cold and hungry. This is a tradition with Santa and me. On the years when I have had to work on Christmas Eve, Santa would always stop by my job for a little visit and a snack. I will be working Sunday evening and right through till 3 p.m. on Monday, Christmas Eve day. Then I will go back on Christmas night. The Mrs' family will be with her on Christmas Day, and I will be with her on Christmas night. I can't wait to watch Pogo on Christmas morning. Everything new excites him so. Hopefully I will be able to get some good photos of him opening his presents. I would love to get a little video of Pogo doing his little happy dance. This little guy is just so precious and brings so much joy to everyone around him. 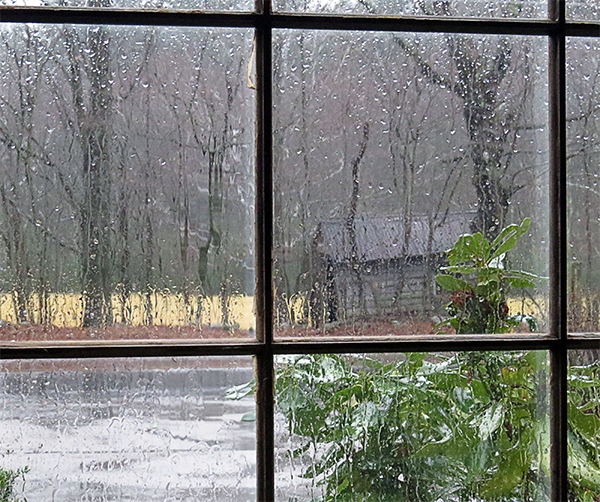 Yesterday, it rained all day right up till about 2 p.m, when the sun finally came out. While it was raining it was also very windy. At times the wind gusts got pretty wild. 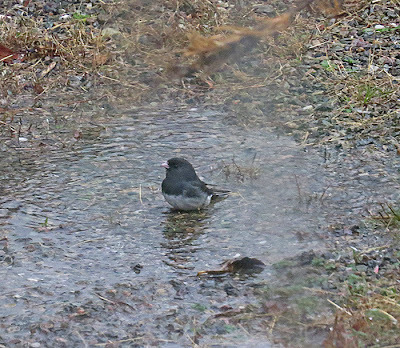 I took several photos of the rain (through the window), including one where a little bird was enjoying a fabulous bath. Later this morning, I will go to the supermarket and buy all the fruits for my fruit baskets. Plus I need to stock up on more doggie food for Pogo. Other than that, Pogo and I are just going to enjoy this wonderful holiday. I believe tomorrow is Su's birthday, so if you have a moment, maybe you could stop by her blog and wish her a happy birthday. I know that would make her feel oh so special. Now I think I'm going to crawl back under my cozy blanket and catch a few more winks. Till tomorrow, Y'all have a wonderful day. Ever Seen A Sparkle Ball? They're Beautiful. Good morning. It's going to be warm, windy and wet today. The weatherman promises temps in the 40's F. I have to share something amazing. Yesterday I made a quick trip to the post office. It was sunny and not very cold. As I was coming out of the post office, I noticed what looked and felt like rain. Sure enough, we were having a sunshiney rain shower. I have never seen this (that I remember) happen before in the winter. It was really pretty. Did you know that at this moment it is 48 degrees BELOW zero in Anchorage, Alaska??? My goodness, how can anyone live with those temps? It makes me feel ashamed for complaining about our cold temps. I guess we sometimes don't realize how lucky we are with what we have. For Nani, I must confess that after your comment I opened my box of goodies. I only took out what I thought was perishable and left the rest in the box. My daughter Deanne saw your comment yesterday, and sent me an email telling me very sternly that I was not to open any more presents. I told you she checks up on me. I did tell Deanne that you said it was okay for me to share some of the goodies with her but she said she could not be bribed. lol. I will take photos of my goodies and post them tomorrow. The ones that I did taste (eat!) were delicious yummy. I must say that I am really enjoying this Christmas. This morning, let me share a photo of what Audrey has been making lately. Someone told her about "Sparkle Balls" and she made a couple of them. Wow, they are really beautiful. 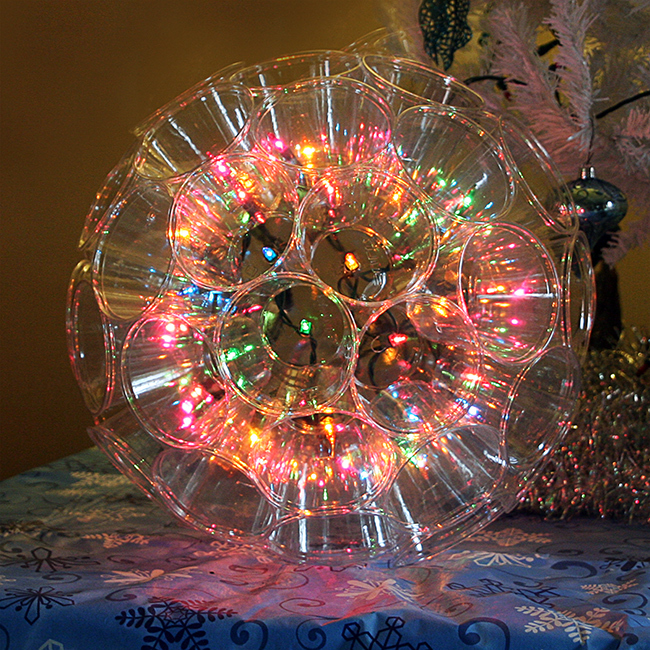 They are made from little plastic cups and a string of mini Christmas lights. Have a look here. Isn't this pretty? If you would like to try making one of these, you can find lots of places with directions on Google. Some even contain videos showing you how it is done. 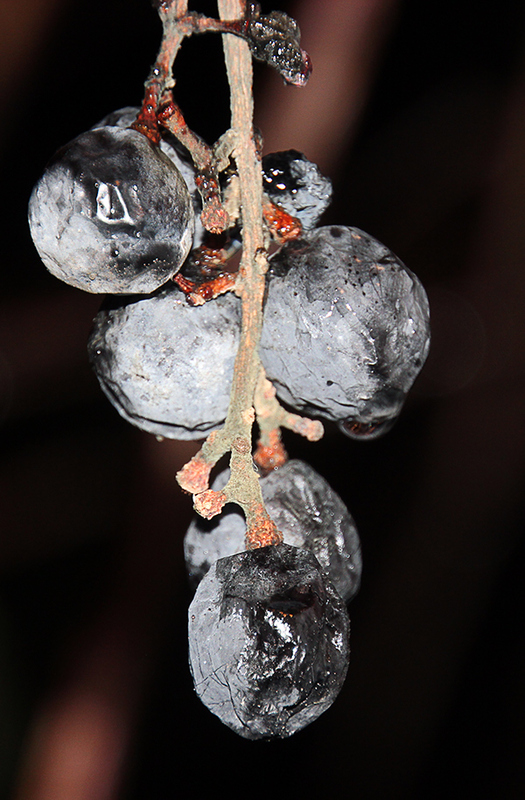 A few days ago, I took a photo of some of the last of the Mrs' grapes. They sort of look a bit petrified. I thought they were quite interesting, though, and worth photographing. Their stems sort of look like tiny reindeer antlers. It's five o'clock now and time for me to start getting ready for work. I have a few busy shifts coming up starting today through Christmas. Then I should be off for a few days. My friend at work has a daughter at home so I swap shifts so that she can be at home with her family for the holiday. That's all my news for this morning, so till tomorrow, Y'all have a wonderful day. 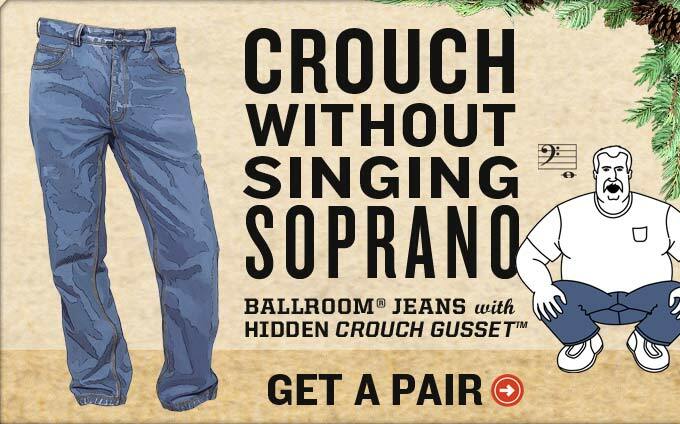 Has Your Man Been Singing Soprano Lately? Good morning. Yup, we're up early again. Actually, I'm up. Pogo had his breakfast and went right back to sleep. If I ever get back to sleeping through the night, it's going to feel funny. Ah well, at least while I am up early like this, I do get a few things accomplished. This morning I did a bit of research on a product I've been seeing advertised on TV. 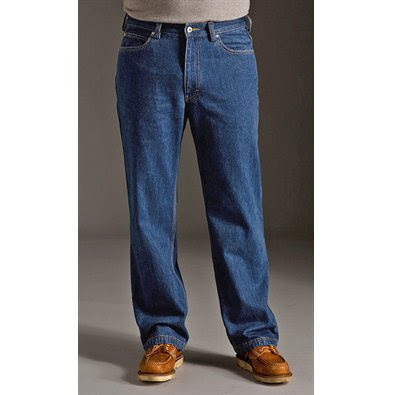 The product is mens' wear called Ballroom Jeans by Duluth Trading Company. Imagine! These jeans are made with a hidden crotch gusset, giving them lots of room for crouching without singing soprano. They start at $49.95 and up. 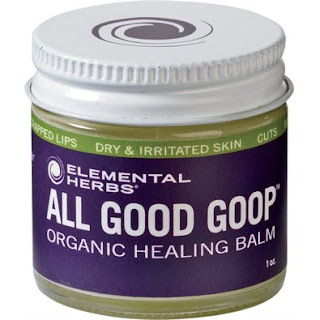 For those folks whose skin is in need of healing, they sell All Good Goop for $8.95 an ounce; and for the man who has almost everything, they have a fabulous lock pick for only $24.95. I have to tell you folks, I really enjoyed myself browsing around this company's web site. 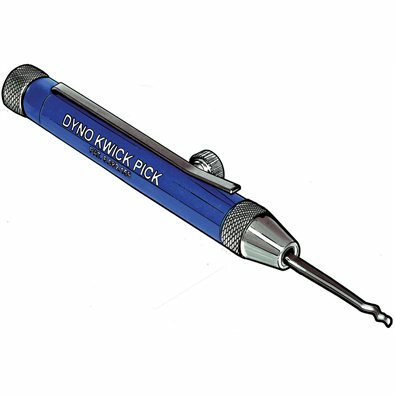 I found one product that everyone could use once the warm weather comes back (some of you already have the warm weather). This item is called a Hydro Neckband. Just soak it in water and it will keep you cool for up to twelve hours. It's not very expensive either, only $8.95 each. I think the price goes down for two or more. 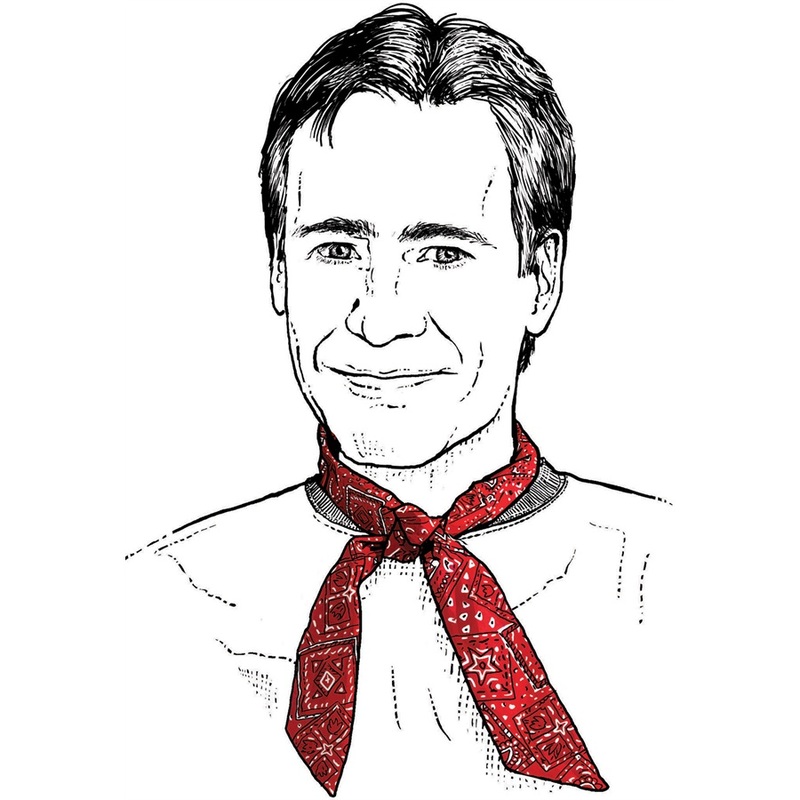 So gals, if you have a manly man in need of more room to crouch, do check out the Duluth Trading Company. He'll surely appreciate it. My other accomplishment was taking care of Pogo's and my travel arrangements for our upcoming vacation. I saved about $200 dollars by getting our airline reservations now. I'll wait till sometime in January to make the auto reservations. Yesterday the mail lady brought us more packages. One was the replacement grass patches for Pogo's Potty Patch. One was for me from Nani, and one was for Pogo from Izzi, his new friend. 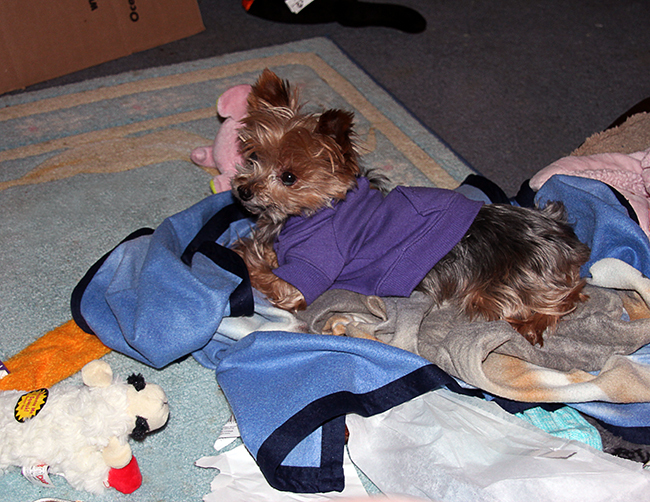 I put Pogo's package on the floor for him to check out, then rescued it and put it under the tree next to my package. 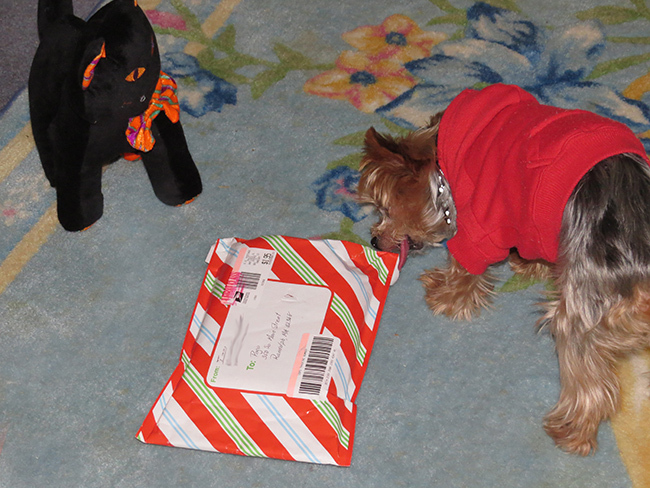 Nani, I have to be good and wait until Christmas to open it. My Dee Dee checks up on me now to make sure I'm not opening gifts. (she's such a spoilsport!) lol. Now I think I'll have me a cup of coffee and maybe wash up the few dishes that I left in the sink earlier. So till tomorrow, Y'all have a fabulous day. Wow, can you believe it? Only six more days till Christmas. And I still have not figured out who my Secret Santa was. Hopefully, we'll find out after the holiday. I would like to thank my Santa personally. 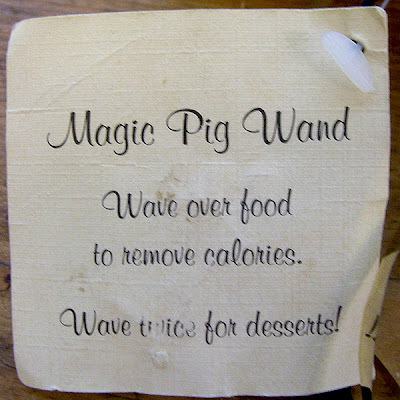 Well, I did go to E-Bay yesterday to look up Magic Pig Wands. Gosh, they really do exist! They are a bit pricey given what they are, but the cost is okay if they really work. lol. They are $15.99 plus $6 S&H, plus taxes if applicable. Here's a photo that I downloaded along with a little tag that explains how the wand works. 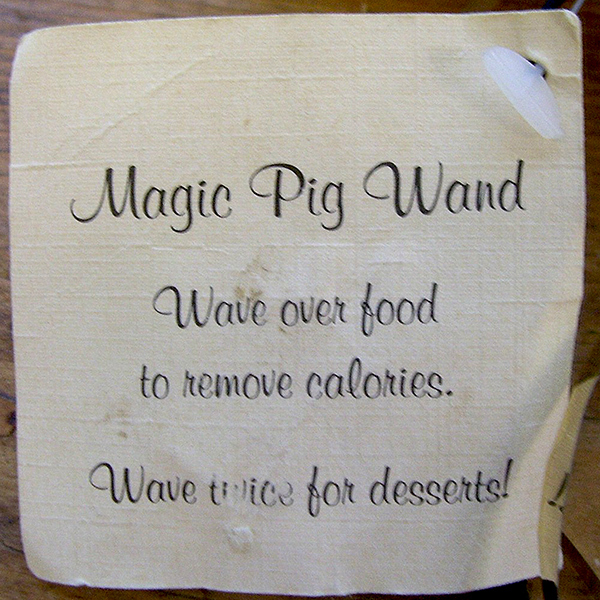 "Wave over food to remove calories....Wave twice for desserts." It looks like this little tag was handled and read quite a few times. lol. So, what do you think? Is this something we should all give some thought to? Today I want to go to the post office and mail my last Christmas box. This one is going in-state so it will get there in a couple of days. I also have a couple of cards still to put in the mail. After that, I will make a big pot of pasta with meat sauce. Janet will be here for supper and this is one of our favorite foods. It's four o'clock in the morning, and I'm enjoying a cup of hot chocolate while I type this post. I had a nap earlier, and got a few hours of sleep during the night so I'm okay. Last evening Pogo and I watched "The Polar Express". I think that was the name. I've never seen this movie before, and I thoroughly enjoyed it. By now, most of you have Su's blog and realize that she is not quite up to par yet, and will delay posting any kit parts until she is feeling much better. Su, the only important thing for you to do is to get lots of rest and get well. Su has a birthday coming up soon too. I think it's a couple of days before Christmas. I'm hoping she is feeling better by then because I'm looking forward to having a nice phone visit with her. Su, here's a lick and a rub from Pogo and a hug from me. Get well. My Pogo is lying here beside me and snoring up a storm. Imagine! The size of this tiny little dog, and you can hear him snoring across the room. lol. It makes me smile because I think he feels safe and comfortable here, and that's why he can sleep deep enough to snore. Well that's all my news for this morning. So till tomorrow, I hope Y'all have a wonderful day. Good morning. It's 5:45 a.m. and it's been a rather sleepless night. Of course, I did have quite a nice nap for most of yesterday afternoon. By now you've figured out that Monday night is not a sleeping night for me. I do get lots of rest though, so I'm good to go. So far, the last couple of days have been wet and gray. Today will be another rainy day, although the temps at the moment are 48 degrees F heading for about 5l degrees. So I guess I can't really complain because it is on the warm side. For this much I am thankful. I have some fabulous photos to share with you today. 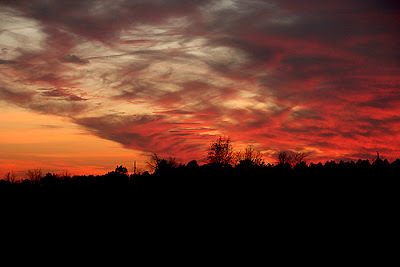 My daughter Audrey took these gorgeous sunset shots from her front yard recently. 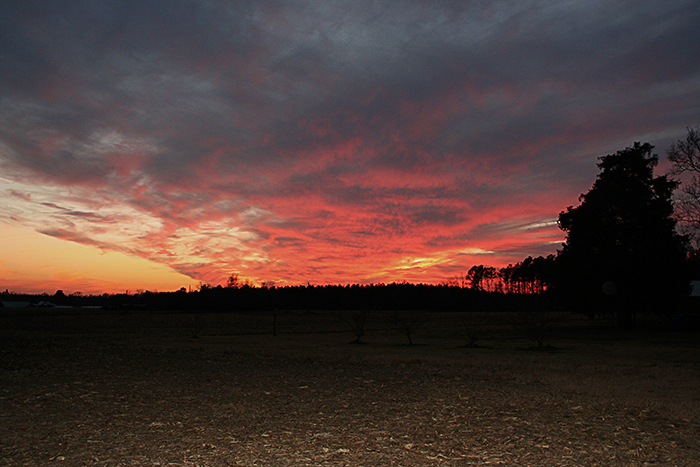 Here's what the sunset looks like in Suffolk, Virginia. I couldn't pick out a best one, so I'll show you my favorites. 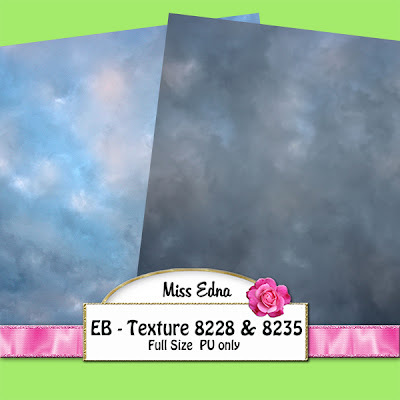 I think I can make a couple of nice textures from these. When I do, I'll share them here with you. I can't take photos like this from my yard because my house is surrounded by very tall trees. So, Audrey, keep these fabulous photos coming. 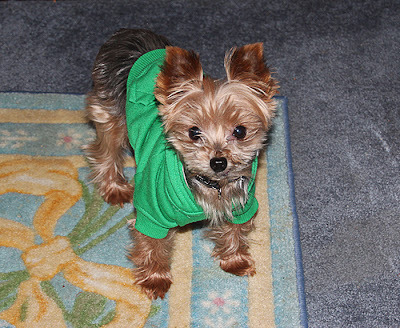 I went on-line and bought two replacement grass patches for Pogo's Potty Patch. Then yesterday, I went to E-Bay and bought me some "fingerless" mitten/gloves. Today I'll go to E-Bay again and see about getting me a magic pig wand. Nani says that this will help to make the "no calorie" cookies for Santa (and me). If it works, just think how I can fix all my food and become ravishingly slender. Oh be still my heart! On second thought, maybe I'll only fix some of my food. I just had a mental picture of an old lady with lots of wrinkles swinging and swaying from her ravishingly slender body. Maybe I'd be better only losing some of the weight. Hmmmm, I'll have to think about this one. Well, now I think I'll make another cup of coffee and catch up on some blog reading. Till tomorrow, Y'all have a fabulous day. Parts 3 & 4 "A Child's Xmas"
Wow, only eight more days until Christmas, and fifteen more days until 2013. Are you ready? This year Santa has to watch his weight, so be sure to leave out non-fat milk and sugar/calorie free cookies for him on Christmas Eve. Is there such a thing as calorie free cookies? Hmmm, I'll have to look into this. These would be great for snacks. Mrs. has been extremely crabby and not very nice lately. It makes for an unpleasant night at work. If I didn't need to work, I might have quit last night. I try to understand her dementia and make allowances for her age, but I really don't think there is a valid excuse for being nasty to people. Some good news..... I got an email from Su last night. 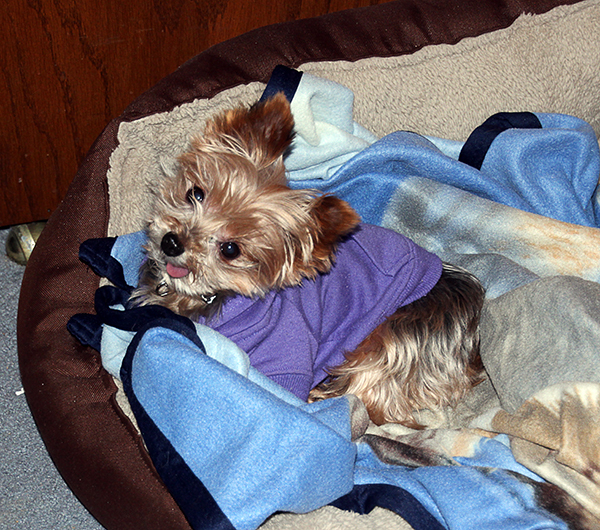 She is home from the hospital, and will be posting on her blog sometime today. Yeahhhhhh! Su, it's good to have you back. I've missed you! 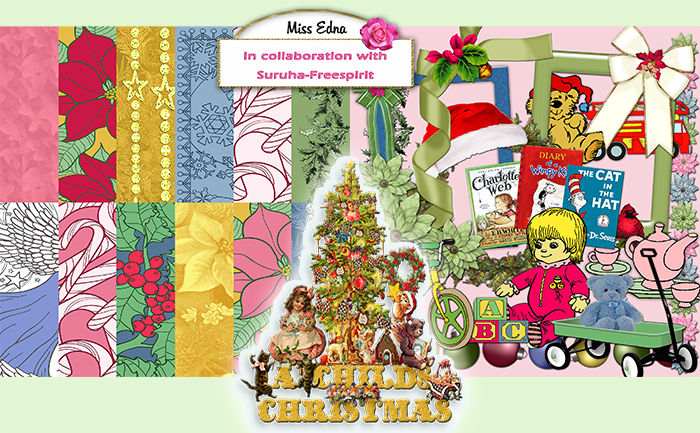 This morning I am posting Parts 3 & 4 of "A Child's Xmas". Su's parts will go up later in the week when she has a chance to get caught up. Here's my preview and your download links. Yesterday, I went shopping at Walmart. Do you remember all their TV ads that say " We match anyone's prices. Our prices can't be beat! Bring us your receipt and we'll match their price." Well, that's a false statement. According to the store supervisor at the Walmart nearest to me, those ads don't apply to all Walmart stores. Unfortunately they don't tell you which stores they do pertain to. I brought them a receipt from BJ's, and they said they could not match the price. Even if they could, they could not do it from a receipt. Somehow, this feels to me like false advertising. If Sam Walton could, he would roll over in his grave. His wonderful stores have been going steadily downhill. They no longer have family values, their stores are badly understaffed, the quality of their products is not as good as it used to be, and employees are no longer treated with respect. The almighty dollar is the only thing that is important to Corporate Walmart today. This is sad. Before I go off on another tangent, I will take my leave here. Pretty soon it will be time to pack up my things and go home. It's been a long night. So, till tomorrow, Y'all have a wonderful day. Good morning. I'm at work and soon will be on my way home. Today is when the wet and maybe white stuff will be starting, and lasting for several days. Oh goodie, goodie. Yesterday, I purposely did not mention anything about that nutcase who killed all those children. It makes me sick to think that someone would take their anger out on innocent chldren. It gets even sicker when you think that once this person is caught, we are going to spend hundreds of thousands of dollars to give them a "fair" trial. I don't understand why we can't just shoot this person when he is caught. (If he hasn't already been caught.) He will be so proud of his deeds that he will gladly brag about what he did. So why should we spend all that time and money on a trial? Maybe when folks do crimes like this, we should just stand them up against a wall and shoot them. Who knows? It might just cut down on this type of crime. Nuff said. If I get started on this, I might not shut up. I'm hoping to stop at a couple of stores this morning on my way home. There are a couple of things I want to check out. I saw an ad for a cute little padded doggie house that I want to look at. Pogo might like something like this. Next, I want to pick up a couple of new little sweaters for him, and maybe another fleecy blanket and a couple of new toys. Except for my fruit baskets, this will finish off my shopping. I got an email from Su's daughter last night. She said that Su might be coming home from the hospital today. Well that will certainly be wonderful. Su has such a beautiful smile, and I miss it! 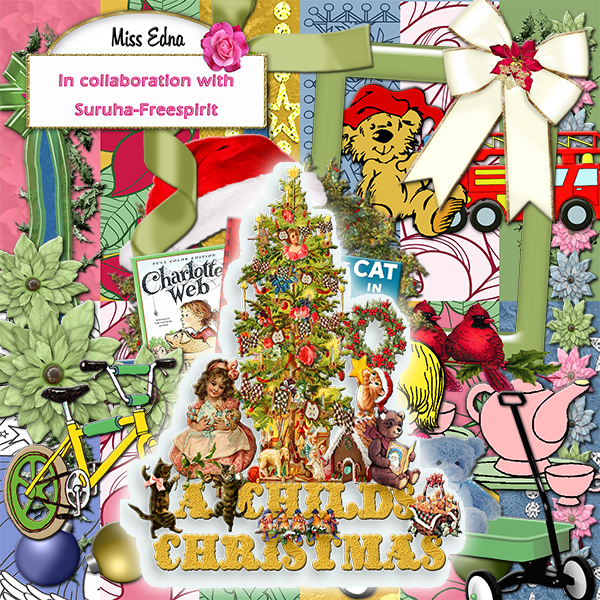 Tomorrow I will post the next two parts of "A Child's Xmas". Once Su is feeling up to it, she will be able to post her parts for you. After that, we might take a break for a few weeks so that Su can build up her strength. If we do, I will still make some freebies for you. Now it's time for me to check on the Mrs again and then get ready to go home. Till tomorrow, Y'all have a fabulous day. Well here I am again in the middle of the night. I should be sleeping but I'm wide awake. I did fall asleep earlier for a few hours, so that explains why I'm up now. I know I'll fall back to sleep in a few hours, so I thought I would post my blog now. First let me say that even though I don't respond to all the comments left here on the blog, I do read all comments and enjoy them tremendously. I have met so many wonderful folks here in blogland. I've learned so much, and expanded my interests because of all the opportunities made possible by my blog and all you wonderful folks. So from the bottom of my heart, thank you. You'll have to put up with me a bit here. I love the Christmas holiday, and I always get a bit soppy this time of year. However, it will pass and I will be back to my own crabby self soon after the new year begins. The Christmas cards have been coming in every day, and I have to say that they get better every year. These cards are simply beautiful. I want to share one card in particular. 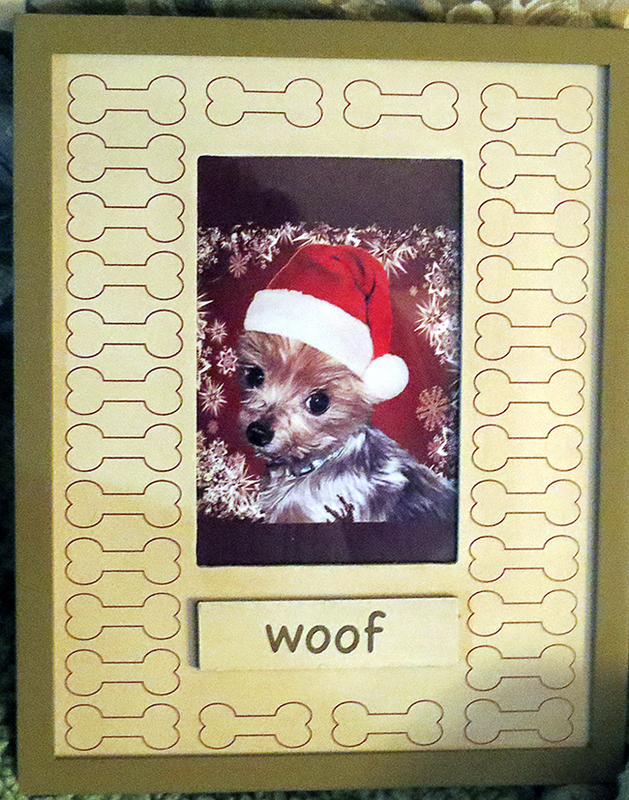 This card came to Pogo from some new blogland friends. Oh yes, fur babies have internet friends too! Gosh, I'm watching the weather channel, and the weather coming our way isn't looking so good. 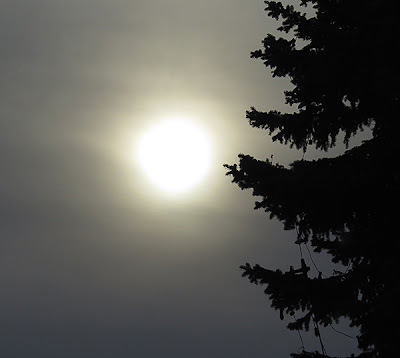 Today will be sunny but cold, about 36 degrees F. Then it looks like we have a mix of rain and maybe snow and slush for the next five out of six days. Pogo's potty patch is looking darn good right about now! Today I will go online and try to order some replacement grass patches. Now I think I'll make us some breakfast, then hopefully catch a few hours sleep. Till tomorrow, Y'al have a wonderful day. Ever Seen A Dwarf in "Remote Withdrawal"? Only eleven more days till Christmas!! And, only eighteen more days till 2013!! I think this has been the fastest year yet. Somewhere along the way while all this time was flying by, my skin got more wrinklier. It's okay for the time to fly if it must, but why do I have to get more wrinkled? Good morning. Today we are having a beautiful warm sunny day. It figures. I'm at work, and by the time I go home, it will already be cooling down a bit. At least the bad weather is staying away for now. After work, I have to see about getting a new remote control for the TV in the main house. The remote stopped working last night, and all of the dwarfs are having "remote control withdrawal". In a way, it's quite comical. Without the remote, they cannot change the channel. Poor babies! I have fun news to share but it will have to wait till tomorrow. I'm at work and the Mrs is needing me. I do have a couple of photos to share though. 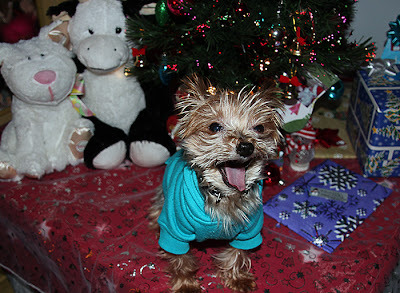 I took these photos of Pogo when we finished opening our Secret Santa box the other day. He was so happy and playful. There is still no news about Su. I'm getting worried now. Please keep her in your prayers that she gets well soon. Now I must get busy, so till tomorrow, Y'all have a wonderful day. It's Here! My Secret Santa Box! Good morning. It's sunny and cold outside. About 36 degrees F, heading for 42 degrees. The weatherman says that starting Sunday, we will have at least four days of rain. About the only good thing I can say about that is "Thank goodness it isn't snow!" Oh boy, the mail lady brought me a fabulous package yesterday afternoon. It was from my Secret Santa, and wowee! What a great package! Of course I opened it. Down deep I'm really a kid at heart. 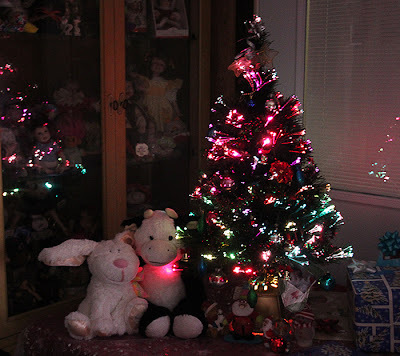 I put everything under my little tree and took a photo to share with you. My Secret Santa really put a lot of thought into this box. It was chock full of all the things I really like. 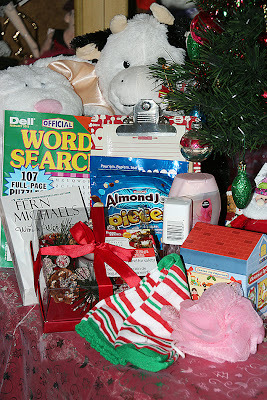 There was a word search puzzle book, a clipboard with paper and pen, a gorgeous pinecone candle ring and candle, holiday socks, a new bath scrubby, a Christmas house full of Almond Joy candy bars, a whole bag of the same wonderful candy, a book by one of my favorite authors, a bottle of Olay body wash, and my favorite cologne "White Musk" by Jovan. I love everything! I always knew that Santa liked me, but wow, what a fabulous surprise! So to my Secret Santa, I want to say "Thank you, from the bottom of my heart." Even Pogo had a great time helping me open each of the individually wrapped presents. He loves to shred paper and toss it around. So I just sat back and watched him playing with the paper for a while. I haven't figured out who my secret santa is yet, but I'm working on it. I've been reading all the different blogs, looking for clues, but some folks are very good at keeping secrets. However, this is also part of the fun, and I'm learning a lot about some very nice folks. I want to thank Suzanne at Colorado Lady for sponsoring this wonderful Secret Santa party. This is my second year, and I absolutely love participating. Now I want to get back to my blog reading. I still have quite a few blogs to go through. I've already looked at each and every blog blog before this, bu now I am really looking carefully for clues. So till tomorrow, Y'all have a fabulous day. p.s. I still have not heard from Su, but I will keep you updated as soon as I hear something. If you want to stop by and leave her some good wishes, I'm sure she'll just love that. Yes Virginia, There Is A Potty Patch Fairy! Hey wow! Look at the date! Today is 12-12-12. I'm thinking that this is the last time we will see a date like this for another hundred years. If I'm reading my calendar right, this month of December also has five Saturdays, five Sundays and five Mondays. Hmmm, a very interesting month indeed! Did the title of today's post catch your eye? Woo Hoo, I am so happy! Earlier tonight, I was just so tired that I decided to skip taking Pogo outside for his sprinkle to see what he would do. Earlier, I had noticed that he had peed on the pee pad in front of his potty patch. So I checked under the grass patch, and will wonders ever cease! I found that he had peed on the grass patch too. Well, this made me so happy, I cleaned up and put a new pee pad in place. So far, so good. I woke up a little while ago (about 1:15 a.m.), decided to wash the dishes that I had left in the sink, and start a pot of corn chowder. 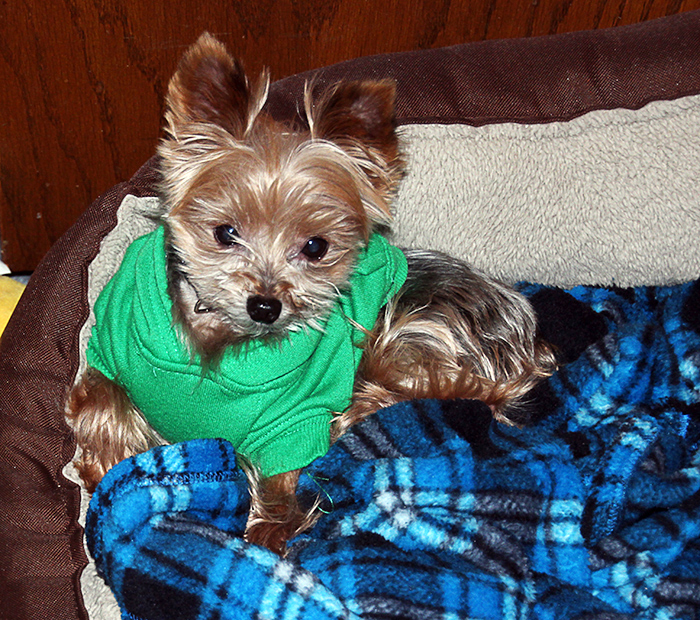 I noticed Pogo slipping out to the pantry, and then back to his little bed. So I went to check, and yes! yes! yes! He had peed on the potty patch again. Does it get any better than this? Now I won't have to go outside in the middle of the night or when the weather is nasty. Woo Hoo, be still my heart!! He still leaves me little gifts here or there once in a while, but he is trying and I love him to pieces. Right now, the potatoes are boiling, and everything else is ready to be put into the pot. When it is done, I'll let it cool, set a bowl of it aside for moi, and put the rest into large bowls in the refrigerator. Instant super delicious suppers! Yum, yum. Let me share a cute photo with you. 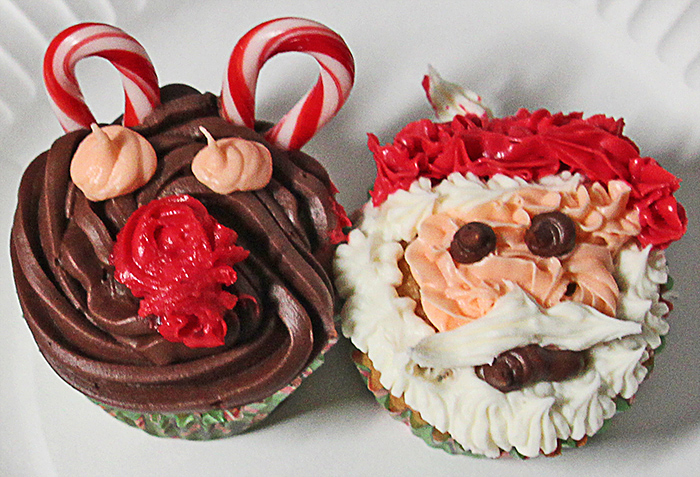 This is Rudolph The Red-Nosed Reindeer and Santa Claus, in cupcake form. My granddaughter Jasmine made two dozen of these for a party with her cheerleading team. I have to tell you how yummy they were. Yes, I shared with Joe. I gave him the reindeer and I had the Santa. Mmm, mmm, mmm. Jasmine, Joe says to tell you that you can send over all the cupcakes you want to. These were wonderful. Thank you sweetie. I'm still waiting to hear from Su's daughter. I'm hoping that the report will be a good one. Su, I'm missing your smile, Get well soon. Now I have to get in the kitchen and finish up the chowder. Then maybe I'll catch a few more hours of winks. Till tomorrow, Y'all have a fabulous day. Good morning. It's six o'clock, and Pogo and I have just come in from his little jaunt outdoors. I was surprised though at how warm it was out there. It's 48 degrees F, and this little gal is not complaining one tiny bit. I think this is perfect winter weather. Gosh, I've been watching the weather channel and the snow that has been/is falling from Wisconsin all the way to Texas. It also showed a nasty tornado that struck in Florida. Actually, there were six tornadoes in four states. Golly, our weather is simply going crazy. Folks, for all of you who have visited Su's website and discovered no parts to the collab kit, please be patient. Su has been in the hospital since yesterday morning. There's a chance that she might be home later today, but at the moment it's not definite. I'll keep you updated. Meanwhile, do send some good thoughts her way to help speed up the healing process. Well, yesterday I finally got my little Christmas tree set up. First I had to do a bit of moving. I had tucked boxes and bags filled with outgoing gifts under the table that the tree sits on. Then I realized that once the tree was up, I would not be able to dig the biggest box out from under the table. Once I had rearranged everything, I could begin the decorating. I make it sound like such a big chore, however my little tree is really only two feet tall. Here, I've shut off the lamps to see if I could capture the tree lights glowing. Pogo helped quite a bit with the decorating. Everything had to be checked out and sniffed thoroughly before it could go on the tree. Once everything was set, he walked all around it, sniffing everything to make sure all was well. Once his job was done, he was tired and gave a big yawn. I'm looking forward to Christmas morning with my little fellow. I've already sent my letter to Santa, asking him to leave lots of little packages for Pogo to open. After all, my little guy has been very very good. One of my next projects will be to go through Tootsie's toyboxes filled with toys and pick out all the new ones. These will be donated to local shelters if they will have them. I should have done this months ago, but it hasn't been easy parting with Tootsie's things. Our local Rocky's Ace Hardware store has been collecting pet food which will be delivered to our local shelters for Christmas. I've already dropped off four big bags of dry dog and kitty food, and plan to drop more off each week when I go food shopping. No fur babies should go hungry. Now I'm going to make another cup of coffee and try to catch up on my emails. Till tomorrow, Y'all have a fabulous day. A New Kit, "A Child's Xmas"
Only Seventeen Days Till Christmas! Only 23 Days Till Christmas!